Stay moving, stretch your routine or stop putting off your resolutions—these special savings put you in control. Find our most popular styles for less during the adidas running shoes sale. With discounts up to 50% off, stock up on your favorite kids’, men’s and women’s runners or take the leap into a new type of training. Looking to get off the beaten path? Snag discount trail running shoes that support your exploration of the great outdoors. Always dreamed of being one of the 0.5% of people who have completed a 26.2-mile race? Our Boston Marathon® running shoes feature a precision fit, energy-returning Boost midsole and grippy outsole for maximum traction in any weather. Save on specialty footwear like running shoes for overpronation that stabilize your foot strike and prevent injury while they’re on sale. Running shoes aren’t just for workouts, either. Performance technology like ventilated uppers and ultra-comfortable cushioning translate to all-day comfort perfect for work or weekends. 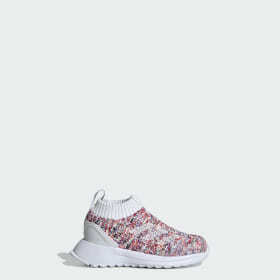 Find game-changing shoes like the adidas Ultraboost and Alphabounce for less during the adidas running shoe sale and pair these sleek minimalist runners with your favorite joggers or skirt for a training-inspired look built for the streets.